Today US military operations are involved in scores of countries across all the five continents. The US military is the world’s largest landlord, with significant military facilities in nations around the world, and with a significant presence in Bahrain, Djibouti,Turkey, Qatar, Saudi Arabia, Kuwait, Iraq, Afghanistan, Kosovo, and Kyrgyzstan, in addition to long-established bases in Germany, Japan, South Korea, Italy, and the UK. Some of these are vast, such as the Al Udeid Air Force Base in Qatar, the forward headquarters of the United States Central Command, which has recently been expanded to accommodate up to 10,000 troops and 120 aircraft. The US Central Command (CENTCOM) is active in 20 countries across the Middle Eastern region, and is actively ramping-up military training, counterterrorism programs, logistical support, and funding to the military in various nations. At this point, the US has some kind of military presence in Afghanistan, Bahrain, Egypt, Iran, Iraq, Jordan, Kazakhstan, Kuwait, Kyrgyzstan, Lebanon, Oman, Pakistan, Qatar, Saudi Arabia, Syria, Tajikistan, Turkmenistan, U.A.E., Uzbekistan, and Yemen. Altogether, that makes 74 nations where the US is fighting or “helping” some force in some proxy struggle that has been deemed beneficial by the nation’s masters of war. But those are just the public operations. Beyond that, there are Special Operations forces in countries. Jeremy Scahill in Dirty Wars: The World is a Battlefield, writes, “By mid-2010, the Obama administration had increased the presence of Special Operations forces from sixty countries to seventy-five countries. Since President Barack Obama has been willing to give the go ahead to operations that President George W. Bush would not have approved, operations have been much more aggressive and, presumably, JSOC has been able to fan out and work in way more countries than ever expected. Global assassinations have been embraced by the current administration, opening the door to night raids, drone strikes, missile attacks where cluster bombs are used, etc. Each of these operations, as witnessed or experienced by the civilian populations of countries, potentially inflame and increase the number of areas in the world where there are conflict zones. The world is literally a battlefield with conflicts being waged by the US (or with the “help” of the US). And, no country is off-limits to US military forces. Top U.S. Terrorist Group: the FBI.!?!! filed under WTF? A look inside Trevor Aaronson’s book “The Terror Factory” about the FBI’s terrorist plots. Please stop killing each other! 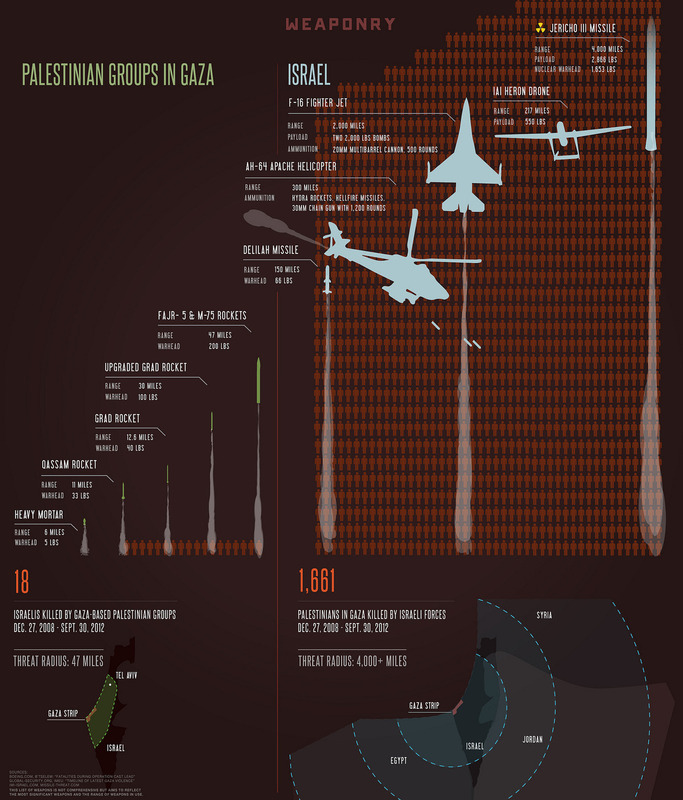 Putting things into perspective, view this new infographic detailing the disparities in weapons arsenals of Palestinian groups in Gaza and Israel. Besides the massive killing powers of the Israeli weapons shown here, what are not displayed are the numerous naval battleships and Merkava tanks owned and operated by the Israel Defense Forces (IDF). Israel has submarines, missile boats, corvettes (the largest warships in Israel’s naval fleet), patrol boats, and numerous chasers and landing ships. Each Merkava tank is armed with two 7.62 machine guns and a 60 mm mortar that can be loaded and fired internally, in addition to the main gun, and has gone through developments to ensure accuracy and lethality. From January through September 2012, Israeli weaponry caused 55 Palestinian deaths and 257 injuries. Among these 312 casualties, 61, or roughly 20 percent, were children and 28 were female. 209 of these casualties came as a result of Israeli Air Force missiles, 69 from live ammunition fire, and 18 from tank shells. As this infographic shows, there is no room for a discussion on the “equal sides of the conflict,” when the reality is a first-world country, with all the trappings of a modern highly sophisticated weapons arsenal, launching devastating and brutal attacks against the most densely populated area in the world, where half its population is youth and 40 percent of its population lives below the poverty line. And where does this military might come from? Israel’s military arsenal is not due to the tax pressure on its citizens, but is largely funded by the United States. American citizens actually pay more money individually and overall to the Israeli military structure than Israeli citizens do. US and Russia planning a syrian armed conflict, cold war no more!!! via stratsrisk.com : Russian Defense Ministry launched an intensive training units for operations abroad, including in Syria.